For all of my fine-feathered friends out there (and really, I’m just talking to the family of wrens who nest in a hanging plant on my screened porch every year), I’d like to say thank you very much! Because without you, I wouldn’t have had a fine story for The Ultimate Bird Lover. Remember way, way back (and for once, I’m not exaggerating) when I wrote that story about Sally the crazy dog gobbling up the baby wren? Yes, I know that doesn’t sound like what you’d call a happy story. But it had a heart-warming point. 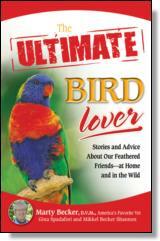 Still, you can imagine my surprise when a fellow from CNN Radio invited me to do an interview about birds and such. On the radio. At CNN. Well, I don’t need to tell you that I high-tailed it to CNN! See, I started in radio way, way, waaaay back in the day, so I was thrilled to see CNN Radio up close and personal. And also, because I’m a ham. Anyway, we had quite the conversation about birds and such. More about “and such” than Sally and the baby wrens. But I managed to wing it(C’mon, you had to see that coming) and I believe The Ultimate Bird Lover was even (briefly) mentioned. Maybe, if you live where a CNN affiliate broadcasts, you heard me blah-blahing away. But if not, you can still read my story. Because truly, it’s a sweet story. Cathy, congratulations on the Ultimate Bird Lover. I received a contract for my story and they pulled it at the last minute. Close though! CNN , now that's a big tweet! Oh my gosh, Cathy!! Too fabulous, dahhhling! What time was the interview on? I really don't know if any of my kin folk down that way listen to CNN radio, but shazzammmm, I can ask! Congratulations! You're a star!! And I'll look for the book as well!! Shoot! You are a sneaky one, Cathy! No way! How awesome are you?! Very cool … I'm to read your article. I wish I'd heard the broadcast … I have no doubt it was quite enjoyable!